A few years back, I started getting serious about making my own bread instead of buying it from the store. Three reasons why: homemade bread is healthier, homemade tastes better, and I had to do something with all those buckets of wheat berries we were storing in our basement. At first, I made the bread dough by hand. But that's a lot of work when you're baking for a family of seven! I tried a food processor, and that worked pretty well, but I could only make two loaves at a time. Plus I burned out the motor. Then I thought I'd give the KitchenAid mixer a try. Not bad, but that motor burned out, too. I'd had my eye on the Bosch Universal Plus for a long time because I'd heard that it's the best mixer for bread. When my KitchenAid bit the dust, I knew what I wanted to replace it with - a Bosch. So, what can the Bosch Universal Plus do that other mixers can't? Is it really everything it's cracked up to be? How does it compare to KitchenAid? 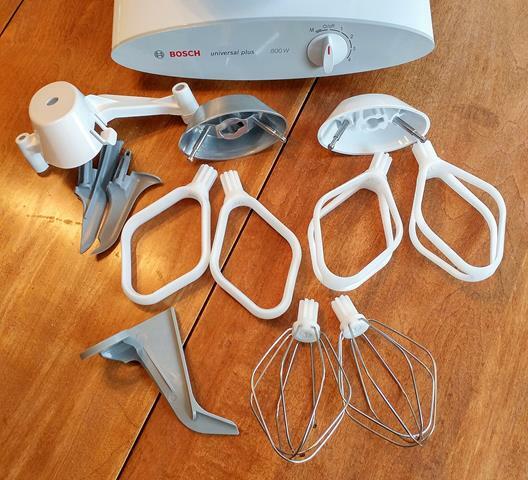 In this review, I'll share information about the Bosch and tell you about my experiences with it so you can decide if this mixer is the best choice for you. How Much Flour Can the Bosch Handle? A Whole Lot! This mixer has a powerful 800 watt motor with a high speed drive transmission. 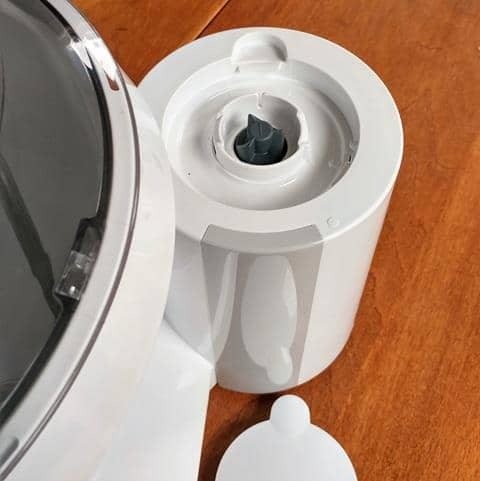 It automatically adjusts the motor speed to match the size of the load in the bowl. That means that it can mix a huge amount of ingredients without straining the motor. I'm talking up to 15 pounds of bread dough at a time. That's right - 15 pounds! Two drives in one machine yields amazing versatility. High torque drive for the mixing bowl and attachments including a meat grinder, pasta maker, slicer/shredder, juicer, and ice cream maker. 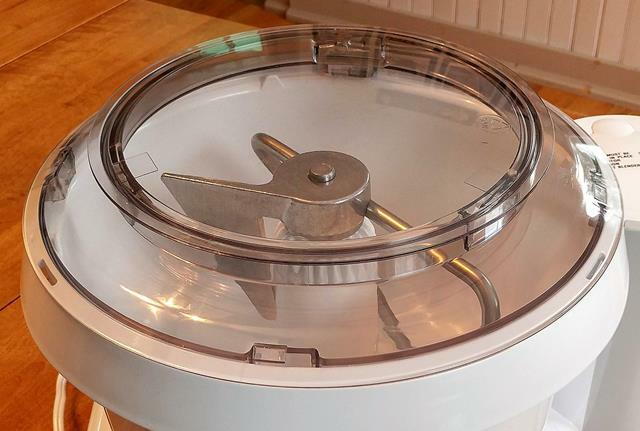 High speed drive for the optional blender and food processor. If you want to get rid of some of your small kitchen appliances and save counter space, this is a great way to go. There are 4 speeds to choose from plus a momentary pulse position, which works like the pulse setting on a regular blender or food processor. This is a big help when you want to combine ingredients a little bit at a time. 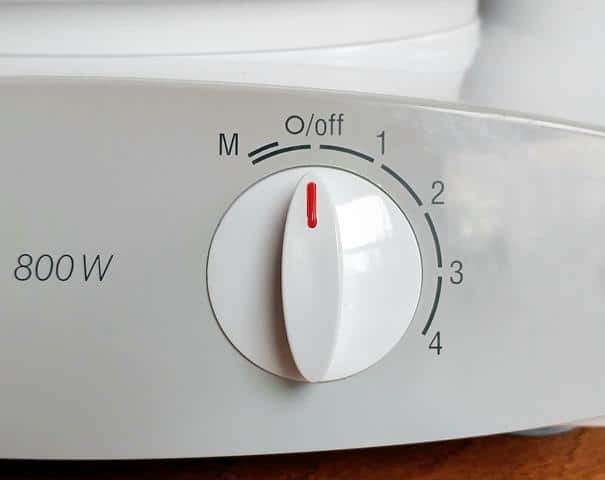 Some powerful appliances tend to vibrate and move around when they're running. That doesn't happen with this one. 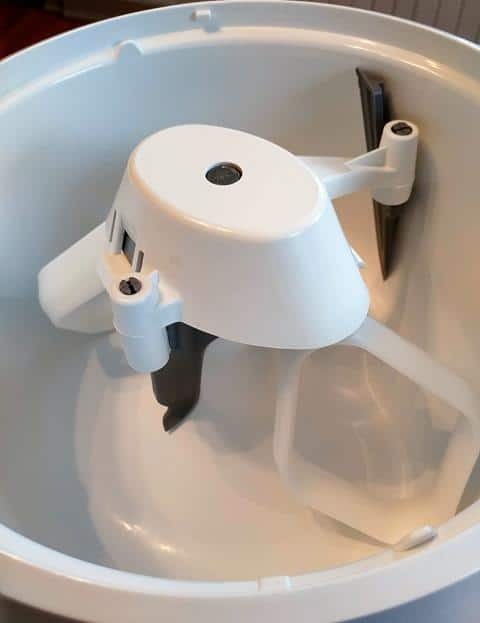 Strong suction cups on the bottom of the mixer stabilize it and keep it from "walking" on your countertop. The motor is below the bowl, and the beaters attach to a drive shaft in the center. So, the top of the bowl is completely open. This makes it easy to add ingredients and allows you to see inside the bowl while it's running. With dimensions of 18" x 15" x 14", it might take up a little bit more counter space than you're used to. But it only weighs 12 pounds, which is pretty lightweight for a stand mixer. That's less than half of the weight of my old KitchenAid, which I rarely picked up because it was so dang heavy. So, if you don't want to keep the Bosch out on the counter, it's easy enough to move it somewhere else for storage. The BPA-free plastic bowl holds a generous 6.5 quarts. Traditional mixing bowls are deep and taper inward at the bottom. This can sometimes cause ingredients to bunch up at the top. But the Bosch mixing bowl has a wide round shape that prevents this and allows for more even mixing. A plastic splash ring and lid prevent splatters and clouds of flour or confectioners sugar dust when you're mixing. Wire whips for making meringue and whipped cream and to aerate light batters. They're also great for making mashed potatoes and for shredding cooked meat. Dough hook for regular to large batches of bread dough and large batches of cookie dough - up to 34 dozen! Splash ring and lid which help to keep ingredients from splashing out of the bowl. You can also take the lid off and add ingredients while the mixer is running. Click here to check the price of the basic Bosch MUM6N10UC Universal Plus Stand Mixer at Amazon. You can also buy the mixer bundled with various optional mixing paddles and/or attachments. Cookie paddles with metal drive for mixing regular size batches of cookie dough and frosting. Cake paddles for quick bread and cake batters. Click here to check the price of the Bosch mixer with Baker's Accessory Pack at Amazon. 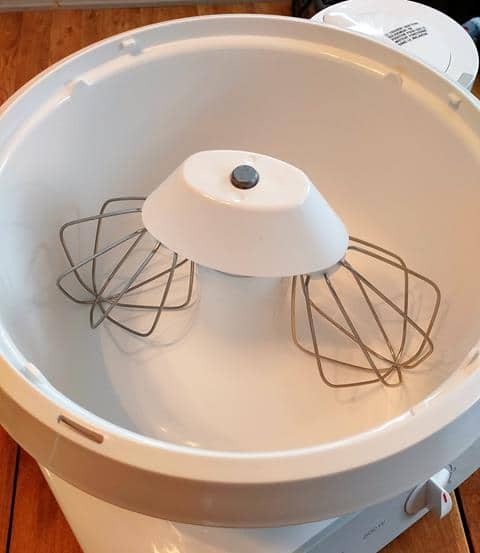 You can put up to 20 cups of flour in this mixer. That's enough for 15 pounds of bread dough! Chances are you'll never need to make that much, but it's nice to know that the mixer can do it. If you've ever made whole wheat bread, you know what a job it is to knead the dough until it can pass the windowpane test. Well, the Bosch makes beautiful smooth dough that bakes up light and airy, even when using whole wheat flour. All you have to do is add the ingredients to the bowl and switch it on. (Well, there's a little bit more to it than that!) The Bosch does ​most of the work for you. When I make a big batch of bread dough, it's done kneading in about 6 minutes. Most people say that cleanup is a cinch. That's because all the parts except for the dough hook and drive shaft are dishwasher safe. But, if you prefer washing by hand (like I do), it's a different story. It's not hard, but it can take a good bit of time if you're using several accessories at once. Like, if you're using the scraper along with the cake paddles, you've got to wash the two paddles, the drive that they're attached to, the two scrapers, the scraper holder, the bowl, the splash ring, and the lid. Even if you're going to put them in the dishwasher, there's some preliminary scraping you need to do. So there's still a bit of work to be done. This hasn't happened to me, but some people say that the cookie paddles are not designed well and break easily. The problem might be that the motor is too powerful for the plastic gears on the paddles. Or in some cases maybe the batch was too big, and it would've been better to use the dough hook. But if you mainly want the mixer for making bread, you can always buy it without the cookie paddles. Plus, the dough hook can be used for mixing cookie dough. You have to use the wire whips first for creaming butter, etc. and then switch to the dough hook when you add the dry ingredients. Not as simple as it sounds, though. I've made cookie dough using the wire whips and dough hook. It's kind of a pain in the neck, to be honest. Scraping out the wires and switching to the dough hook is time consuming and messy. I definitely prefer using only the cookie paddles for making cookie dough. There is a one year warranty on those, so it might be worth a try. And like I said, I've been using them and haven't had any trouble. Here's where the Bosch Universal shows off its versatility. Sometimes you can find the mixer bundled with one of the attachments. For example, you might get it with the blender. (Click here to check availability and price at Amazon.). You can also buy the cake paddles, cookie paddles, scraper, and dough hook extender separately. It's less expensive to buy the mixing paddles and accessories bundled if you think you want to have all of them. On the other hand, you might want to get the basic mixer to start and see if that's enough to meet your needs. Here's a quick look at how the Bosch Universal stacks up against KitchenAid's most powerful stand mixer, the Pro 600 Series. That makes a big difference if your main task is making bread dough. It's not hard to burn out a mixer motor on bread dough. That's how I broke my old KitchenAid. It was 450 watts, not 575. But still, it was supposed to be able to handle two loaves of bread dough, and it didn't. I don't have any fear of burning out the motor on my 800 watt Bosch. The mixing bowls are about the same capacity. But, the design of the Bosch allows it to hold much more than the KitchenAid - 20 cups of flour versus 14. The KitchenAid is a lot heavier than the Bosch. That might not be important if you are able to leave your mixer out on the counter. But if you need to move it on a regular basis, the Bosch is going to be easier on your back. This is where I think KitchenAid beats out Bosch. Having owned both, I can tell you that the KitchenAid is simpler to use. Just put on the correct single paddle, hook or whisk, and turn it on. 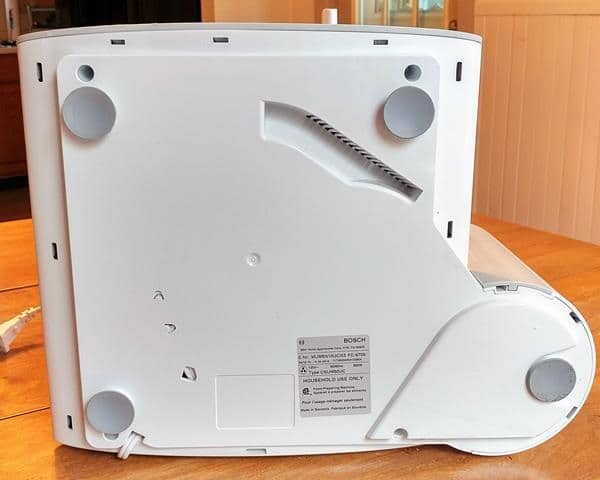 The Bosch has more parts to put together, except for when you're making bread dough. And the KitchenAid is much easier to clean, again, because it has less parts. Before my KitchenAid broke, I always used it to make pancake batter. 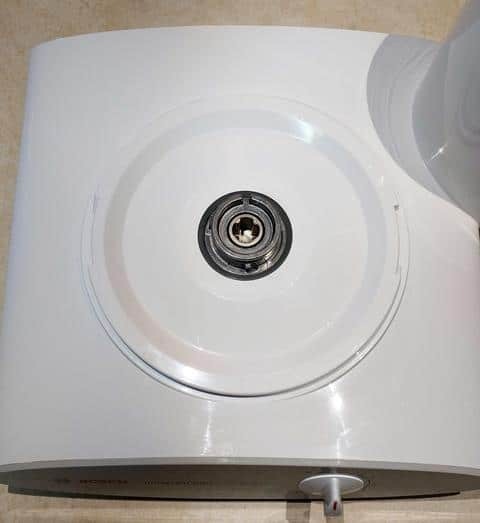 After using the Bosch a few times for pancakes, I decided it wasn't worth the effort because of the cleanup. It's also not easy to pour or ladle batter out of the Bosch bowl because of the shape. So now I usually make batters by hand in a bowl with a whisk. But I'm holding out hope that Santa will bring me a hand mixer or immersion blender for Christmas! Yes, there are times when I miss the old KitchenAid, but not when I'm making bread. I never felt like the KitchenAid dough hook did a great job of kneading. It was okay, but I usually had to do some additional kneading by hand to get it just right. That doesn't happen with the Bosch. There's just something about how it's designed that turns out perfect bread dough every time. Plus I love being able to make big batches of dough. I make all of our bread, but I only have to make it once or twice a month. The Bosch is a big time saver for bread bakers. The KitchenAid does a good job of whipping with its single whisk attachment. But the Bosch has two whisks that spin independently as they rotate in the bowl. This triple action whips the ingredients in far less time. For what you get, it seems to me that it's worth paying a few dollars more for the Bosch. Bosch offers a 3 year manufacturer warranty on the motor and transmission and a 1 year warranty on the plastic parts. I heard a Bosch spokesman say that the inside parts of the mixer are made of metal and should last a long time. In fact, he said that the average lifespan of this mixer is 27 years! And that's with regular use by an average household. That's a pretty darn good record, if you ask me. I found several websites that sell the Bosch mixer. The prices were almost all identical, and most have free shipping. The bundles aren't available at all of the online retailers, though. So, you'll want look around, and be sure to check out what's available on Amazon. The KitchenAid Professional and Bosch Universal are both high quality mixers, and I wouldn't hesitate to recommend either one. However, when it comes to making bread dough, Bosch is the clear winner. If all you want is a mixer for the basics like cake batter and cookie dough, then I'd say the KitchenAid is your best bet. 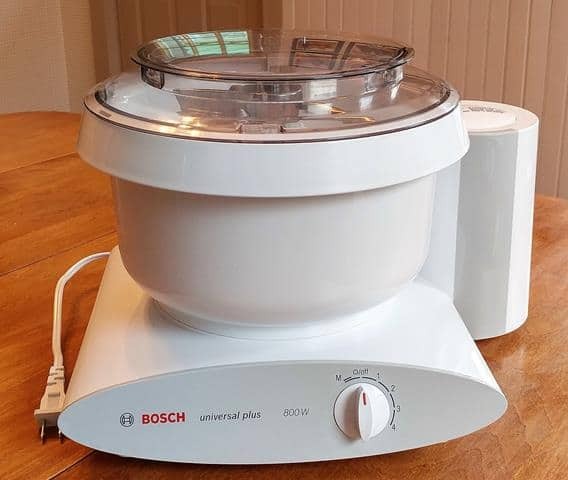 But if you want a powerful all-in-one mixer that does all the basics and allows you to make large batches of bread dough and cookie dough, you'll be happier with the Bosch Universal. Add to that the array of attachments you can get for it, and this might be the only food prep machine you ever need! If this sounds like the kind of mixer you just can't live without, you can go check the price and availability at Amazon right now..